Device would be ‘another layer of protection’ at jail. 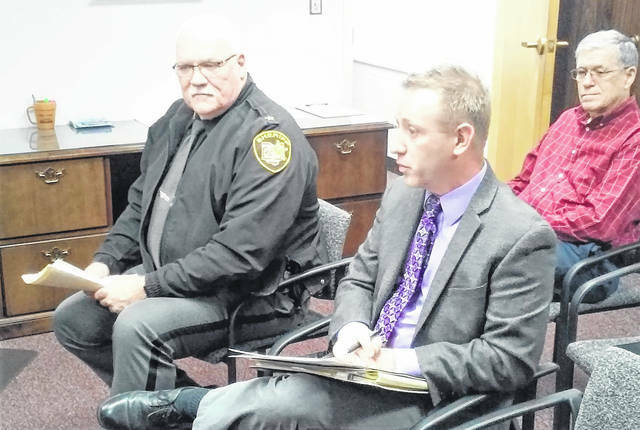 At Wednesday’s commissioners meeting, Highland County Sheriff Donnie Barrera, left, and Aramark representative Mike Colvin, center, discuss Aramark’s proposal to have a new body scanner installed at the Highland County Jail. Also in attendance was Highland County Auditor Bill Fawley, shown at right. Stating that safety and security are the biggest challenges facing facilities like the one in his charge, Sheriff Donnie Barrera has proposed to county commissioners that a high-tech body scanner be installed at the Highland County Jail. He said that those who smuggle contraband, mainly drugs, into the facility have become so creative and ingenious in their methods that many jurisdictions are embracing next generation scanners that reveal more of what’s trying to be concealed with minimal radiation exposure. He said that the proposed scanner installation would be a benefit to all law enforcement, since in his view anyone being booked into the jail would be subjected to another layer of protection and security. Aramark Food, Facility and Uniform Services representative Mike Colvin told commissioners their meeting this week that his company operates at 28 correctional facilities for food, laundry and other services in southern Ohio, Kentucky and Indiana, and has been providing food services to the Highland County Jail since the facility opened in 2001. He said as part of the ongoing partnership with the county, Aramark has put forth a three-, five- or 10-year contract proposal designed to finance the purchase of a scanner for the county. The scanner under consideration by the commissioners is the SOTER RS full body security scanning system from OD Security/North America, which is designed to detect metal, plastic, organic and inorganic contraband that may be concealed outside or inside the body. According to information from the OD Security website, the entire scanning process takes between eight to 10 seconds, with no radiation exposure to the jail operator and minimal exposure to the inmate being booked. The technology isn’t cheap, he said, with the scanner in question costing upward of $120,000, but Aramark’s proposal has the financing coming as part of what the company charges per meal for inmates. Abernathy said the average price per meal was $2.60, but after Barrera took office in 2015 that amount was reduced significantly to the current price of $1.83 per meal, due to negotiations between the sheriff’s office and Aramark. If the county finances the total cost of the body scanner, Aramark is offering three options. Under a three-year agreement, the meal price would rise to $2.42. If commissioners agreed to a five-year contract, the price would be about $2.20 per meal, while under a 10-year agreement, inmate’s meal prices would be $2 per meal. Abernathy endorsed the scanner proposal and indicated he personally would like to see a decision made on acquiring the equipment before year’s end. If commissioners sign off on any of the three Aramark contracts, Barrera said the unit could be installed and in operation at the jail in 45 days.